[News from the News Center] Organized by the North China Regional Working Committee of the MoE University Physics Teaching Advisory Committee (Hereafter the Advisory Committee), and hosted by Yanshan University School of Science, the working conference was held on April 10 in the Century Building. Twelve representatives from nine universities of five provinces, municipalities and autonomous regions of North China attended the meeting. Liu Yong, Dean of the School of Science, and Wang Mingli, Deputy Dean, attended the meeting on behalf of YSU. The meeting was hosted by Professor Li Yan from the School of Physics, Peking University and delivered a welcome speech. Li Yan speaks at the conference. 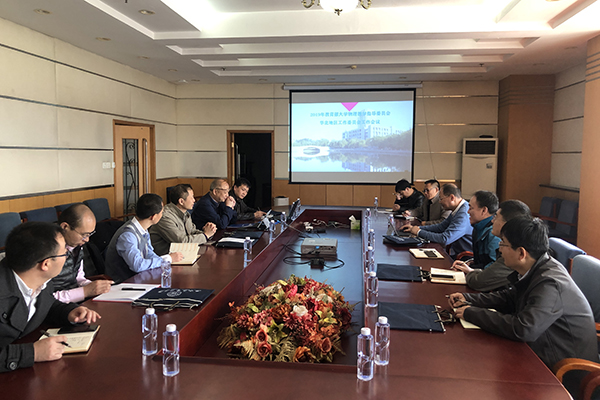 At the meeting, Prof. Li Wei introduced the specific establishment of the Advisory Committee of the University Physics of the MoE from 2018 to 2022.He reviewed the work in 2018 and the work plan for 2019. The members also focused on the some key themes as physics teaching of universities, the direction of teaching reform, and the teaching competition. They also expressed their views on the serious shortage of physics teachers and the weak basic physics knowledge of new students, and some constructive suggestions were put forward.